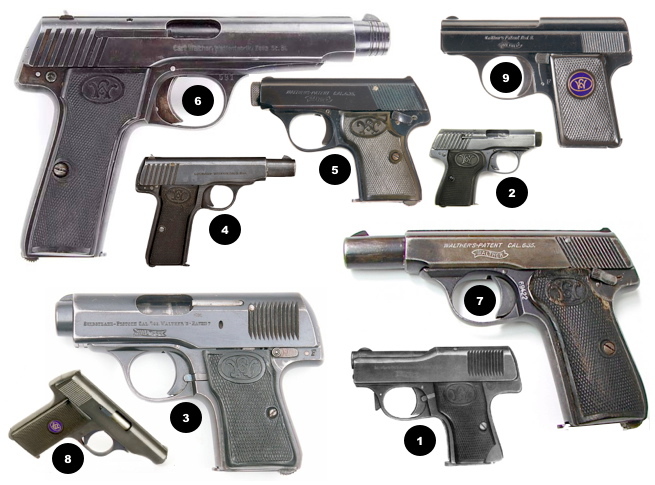 This web site is dedicated to early Walther Pistols and focuses on models 1 - 9. We are currently collecting data to better understand all of the variations of each model. We are constantly updating the site with new information, please consider sharing information about your Walther with us. © 2018 RJK. All Rights Reserved. Other brands, products, or service names mentioned are or may be trademarks or service marks of their respective owners. Notice: This content is for informational purposes only and does not set forth any warranty, expressed or implied, concerning anything. We reserves the right to make changes to this document at any time, without notice, and assumes no responsibility for its use. We are not an FFL and do not sell firearms.